Happy Valentine’s Day! I know that on this day of love, I’m supposed to offer you a rich, sugary indulgence or at least a romantic dinner for two with aphrodisiac potential, but what, dear reader, do I have in store for you instead? The lowly and much-maligned bean. 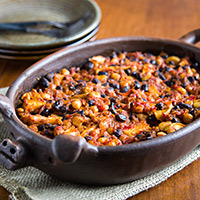 And black beans, with their dark skins, are loaded with phytonutrients so they’re especially heart-protective. Moreover, beans are good for lowering blood sugar, promoting digestive health, and decreasing risk of cancer. We all want our Valentines to be healthy! 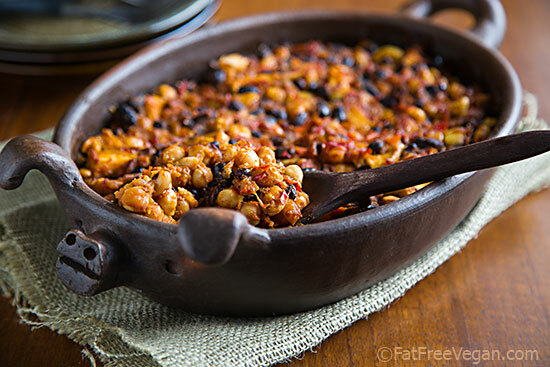 So my Valentine’s gift to you today is this sweet and spicy casserole, made with three types of heart-healthy beans. I couldn’t resist the chance to make a normally bacon-laden dish in the “pig baker” casserole dish that my sweet husband and daughter bought me for Christmas. I’d seen it in a local kitchen store and thought it was adorable, and apparently they were taking notes because they surprised me with it on Christmas day. I love his stub nose and floppy ears, and I’m happy to give him a home where he will never be forced to cook bacon or ham. 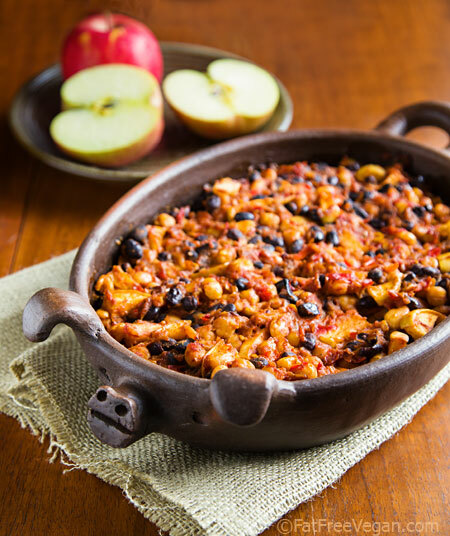 Speaking of bacon, most baked bean recipes almost cancel the health benefits of the beans by loading them down with pork and sugar, but my delicious vegan beans are sweetened only with dates and apples. And, if you’re watching your salt, you can cut the sodium in half by using unsalted beans. So cook them for someone you love today! Since they contain no high-fructose corn syrup, these beans are subtly sweeter by the dates and apple. Heat a large nonstick skillet over medium-high heat. Add the onion and saute until it begins to soften, about 3 minutes. Add bell pepper and minced garlic to the pan and sauté for another 3 minutes, stirring occasionally. Add the apple and cook for another minute. Add the beans and remove from heat. Combine tomato sauce and all remaining ingredients in blender. Blend at high speed until the dates are completely smooth. Pour this sauce into the onion and beans, and stir well. Spoon mixture into an 11 x 7-inch non-metal, lightly-oiled baking dish. Cover and bake at 350° for 30 minutes. Uncover and bake an additional 30 minutes. If medjool dates are not available, you can use 2 ounces (about 1/4 cup packed) of any pitted dates. Or substitute 1/4 cup of any sugar or syrup. With the dates, one serving is 2 points on Weight Watchers Freestyle program. The points come only from the dates, so if you substitute for them or use a different amount, the points will change. Have a lovely and loving V-Day! I’ve made these before and they turned out great. I’d like to make them for my daughter’s graduation party and was wondering if they could be made ahead and then frozen? Sure! I think they’d freeze just fine. I entered “romantic dinner” in your search engine and this recipe came up. It was delicious and my husband loved it! Smokey, and the beans are not overpowering. And it is a mighty dish. I served it with tiny new potatoes (skin on) and baguette. It will become a staple since it is so easy to make. Susan, thank you for keeping up such a great site.